Next day morning, there was a knock on the door. I opened the door and standing there was a small, petite and bubbly woman. 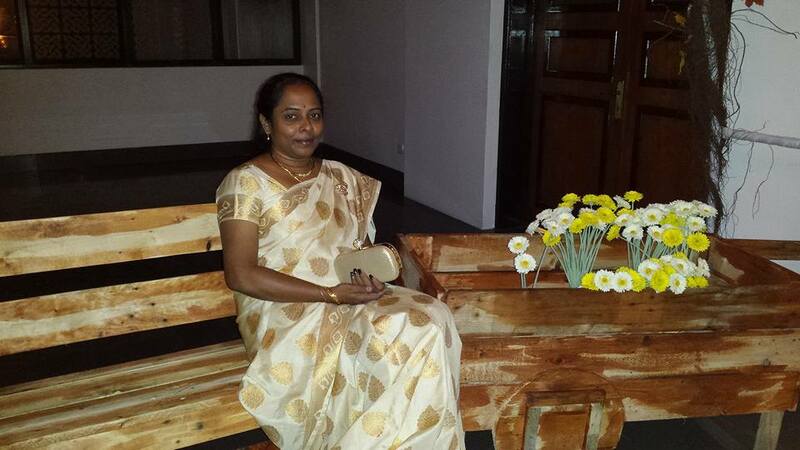 She barged in “My name is Annie Clara; I am from Tamil Nadu”. She announced, “I am a lecturer in the accounting department of PEDA, Bahirdar University. Addis told me that you had come and I came to welcome you”. I was touched. Here we are, thousands of kilometres away from home and we are being received so warmly. Clara assured us that she would help us for anything that we need. 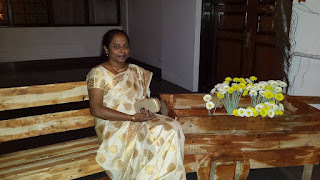 I thanked her for her visit and generosity. We were not getting our food, so we volunteered to try the local food. The local Chapatti or the staple food is the Injira. Injira is like a huge flat bread or like a very gigantic dosa. 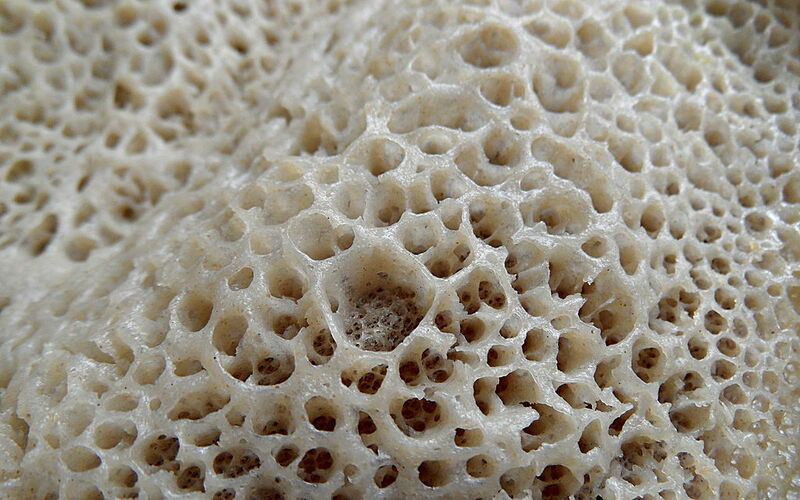 Injira is made from one of the tiniest grain in the world. The iron rich grain is called Teff. Injira is a dough risen flat bread with a sour, unique spongy texture. Injira is the national dish of Ethiopia. The first time we had Injira, it was a huge let down. It had a very sour taste and it was very huge. The quantity would be enough to make 6-8 Indian dosas. Injira is round and is twenty inches in diameter. The interesting part are the side dishes that are put on the top of the Injira. 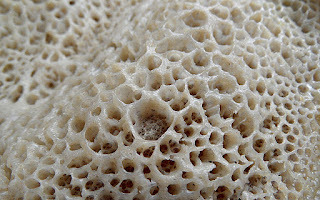 The nearest Indian equivalent of the Injira is an Uttapam but fermented many times over. Teff flour is mixed with water and the mixture is allowed to ferment for several days. As a result of this process, Injira gets a definite sour taste. The Injira is then baked into large, flat pancakes. Injira is never eaten alone. It is always served with several kinds of wats (dals) or curies or stews. There can be two or three different types of wats made of meats (mutton, chicken or beef), egg, many types of salads and a little rice. The amount of rice eaten by an average south Indian would feed atleast fifty Ethiopians. Typically, spoonful of rice is served along with the Injira. As the Injira is spongy and granular, the wat soaks it thoroughly and that makes the Injira very tasty. Initially it was quite difficult to eat an Injira. But later on we started enjoying it and Padma often says that she misses an Injira. We did have Injira in California, USA. 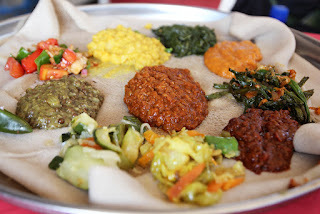 No doubt It was tasty but to experience an authentic Injira one needs to taste it in Ethiopia. Usually Injira is eaten with different types of meats like Dora (Chicken) wat, Tibs (pieces of fried meat pieces). There are many variations of the delicacy, depending on type, size or shape of the cuts of meat used. 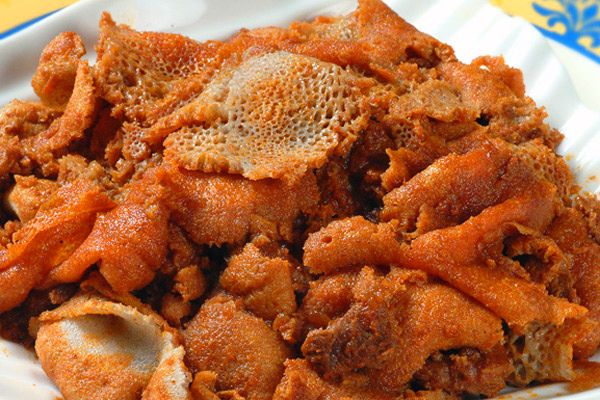 But during the lent and on Wednesday and Friday a vegetarian Injira is eaten, my favourite called the Beyeyanetu. 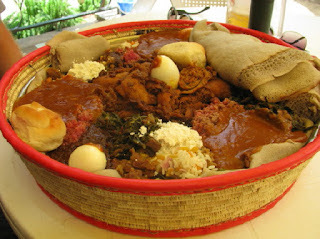 Whenever I went to the restaurant in Ethiostar and proudly ordered a Beyeyanetu, the waitress would giggle. Annoyed and irritated, I complained to the Manager of the hotel. He came back to me beaming “Sir, the girl is actually very flattered that you are ordering an Ethiopian dish and that too in Amharic. But your accent is that of a very small child just learning Amharic. She finds it very cute”. I don’t know whether it was a compliment or an insult to be compared with a child. Fit-Fit or Fir-fir is a common Ethiopian breakfast dish. It is made from shredded Injira, stir-fried with spices or wat. Another popular breakfast food is Fatira. The delicacy consists of a large fried pancake made with flour, often with a layer of egg. It is eaten with honey. The Most Popular snacks are Dabo Kolo (small pieces of baked bread). 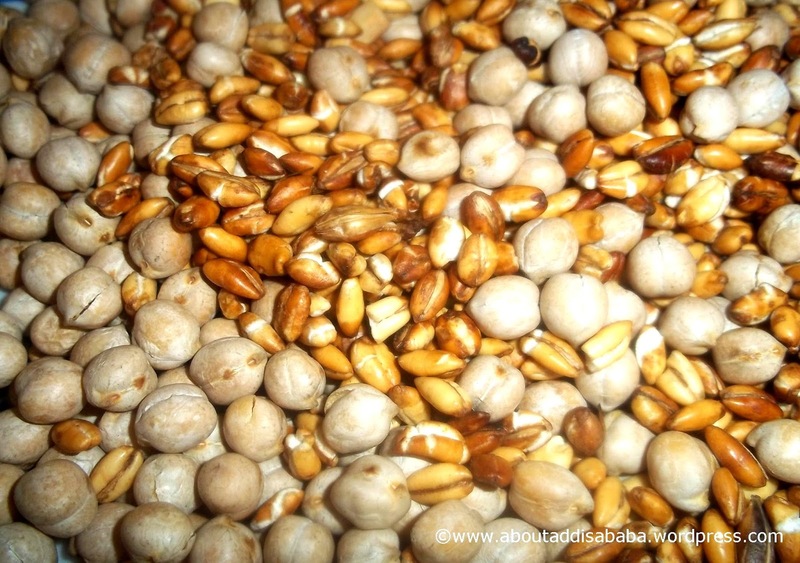 Ethiopian Kolo (roasted barley mixed with other local grains). 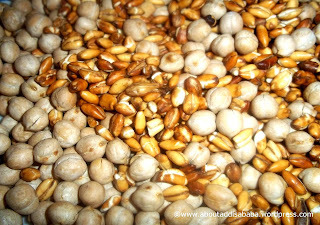 Kolo made from roasted barley, chickpeas and peanuts is often sold by street vendors wrapped in a paper cone. Popcorn is also popular as a snack. Surprise of surprises, a delicacy called Sambusa (Indian Samosa) is also popular in some parts of Ethiopia. But the filling is not potato, instead mashed lentil (green gram) is used! Talk of globalization of Indian food. 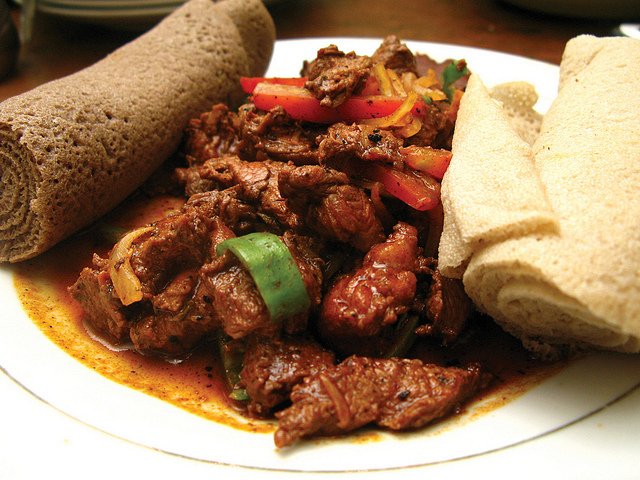 As the Injira is rich in Iron and not in Carbohydrates, Ethiopians are typically thin and wiry. African athleticism and high altitude climate, makes most Ethiopians have good physique. In 2002, it was very rare to see a fat Ethiopian. So whenever they see a very a large man or woman they would get fascinated and follow that person. Of-course the obvious ribbing and ragging would automatically follow. Due of their easy going nature and their natural good genes and healthy eating, incidence of Heart attacks are very rare in Ethiopia (166th rank out of 172 countries surveyed) whereas India is a high risk country with a global rank of 39. One-day right in front of Ethiostar there was a head-on collision that involved two bicyclists. In India it would have led to an altercation where all the bystanders would join in merrily, create a huge ruckus and finally it would lead to a massive traffic Jam. The aftermath of the crowd disturbance in many cases would be many times more severe than the accident itself. But here both the Ethiopians who were sprawled flat on the ground got up, dusted themselves and hugged each other. There was exchange of pleasantries and after checking each other’s bicycles they went on their respective ways. Such a charming way to solve minor problems. Ethiopians tend to wear lots of clothes. A typical Ethiopian would wear many sets of clothes and wear a coat and cover their body with a white cloth. Most of the Indians were initially skeptical of this habit but quickly realized that it was a very wise decision. In a country where the climate is variable and the temperature fluctuates by as much as 20 degrees centigrade in a day, it is better to cover the body with protective clothing so that the body does not get too cold and suffer from debilitating diseases. Even in a city bus the locals would keep all the windows shut and would rather suffer the suffocation rather than let the cool breeze come in. Perhaps they were also protecting themselves from the dust rising out of the metal roads.